Russsell Hartenberger’s new “Moondog Suite” will premiere on June 13th at Open Ears Festival. 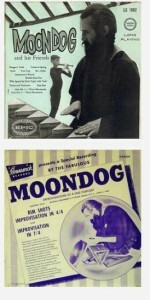 Russell was inspired to explore Moondog’s work not only by the eccentric composer’s “snaketime” rhythms (see last week’s posting) , his unusual uses of ambient sound, and influences that ranged from Native American through jazz to classical, but also by Moondog’s many instrument experiments. Among the instruments that Moondog invented was a small harp shaped like a triangle and called the “oo”, and another which he named the “ooo-ya-tsu”. Moondog was attracted by triangles and his “hüs” (after the Norwegian, “hus”, meaning “house”) is a triangular stringed instrument played with a bow. His best known creation is the “trimba” (shown above), which is yet another triangular instrument, this one a percussion instrument, that he invented in the late 1940s. 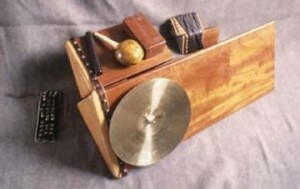 The original Trimba is still played today by Moondog’s friend Stefan Lakatos, a Swedish percussionist, to whom Moondog also explained the methods for building such an instrument. In the photo below you can see Moondog hand-drumming on an instrument made up of a row of triangles. These album photos are from the Weird Music site. We hope to see you at the Open Ears Festival, Registry Theatre in Kitchener Ontario on June 13. Stay over for the exciting performance of Steve Reich’s “Drumming” the following day!